(LA Times) After 36 years as a California government transportation engineer, Bijan Sartipi retired with much more than a goodbye party: He was paid $405,000 for time off he never used — one of more than 450 state workers who took home six-figure checks when they left their jobs last year. And Sartipi didn’t top the list — a prison surgeon in Riverside pocketed $456,002. In a trend that stems from lax enforcement of the state’s cap on vacation accrual, more and more state workers are able to retire with massive payouts for unused vacation and other leave. That could become a budget breaker for California as an aging workforce heads into retirement. During the next recession, California will be obligated to continue the payouts, forcing lawmakers to cut programs to balance the state budget. Last year, the state paid its employees nearly $300 million for banked time off, according to a Times analysis of payroll data from the state controller’s office. The data include most agencies and departments, but not legislative employees or other taxpayer-funded institutions such as the public university systems. That means the actual cost to taxpayers for unused vacation is much higher. The total unfunded liability also does not account for employees who used stockpiled days off at the end of their careers to remain employed while not actually working, boosting the value of their pensions. All told, state workers had $3.5 billion in unused leave as of 2017, the most recent estimate available. The blame, said Stanford public policy professor Joe Nation, rests entirely on government mismanagement. California mandates that vacation balances for most employees be capped at 640 hours. Sporadic enforcement of the rule, coupled with an increasing number of state workers retiring, has led to a 60% rise in the number of six-figure payouts since 2012, when 280 employees each cashed in unused paid leave totaling $100,000 or more, The Times’ analysis found. Some departments have offered workers a chance to cash out up to 80 hours accrued time off each year in hopes of reducing the liability of larger payout when workers retire at a higher salary. According to the Department of Finance, the state wrote checks totaling $111 million over a three-year period ending in 2017 to help reduce vacation balances — an effort started under former Gov. Jerry Brown. Most private-sector employers cap vacation between 40 hours and 400 hours and do not allow time to be earned beyond those limits. In California, public-sector union contracts are negotiated at the direction of the governor and must be approved by the Legislature. Any changes to how much vacation employees could store would have to be negotiated and such concessions would not come easily. The state’s powerful and deep-pocketed public-sector unions showered Newsom with contributions, and labor is also among the biggest donors to Democratic lawmakers, who have supermajorities in both houses of the Legislature. State Sen. John Moorlach (R-Costa Mesa) said revising the vacation policy would help California contain its liabilities, but did not believe that was politically feasible. State workers also enjoy another vacation perk most public sector workers have not heard of. When employees cash out their banked leave, the state government pays them not just for the hours they have on the books, but also projects how much additional time they would have earned if they had taken the days off. That means a person with 640 hours of vacation would also be paid for all of the vacation and holidays they would have earned had they taken those 80 days off. For some, vacation payouts can surpass annual salaries. And since state labor code requires employers to compensate workers for unused days off based on final pay rate — not what they were earning when the time was accrued — the actual cost of each vacation hour increases over time. The top 20 employees with the largest payouts in 2018 took home a combined $5.9 million, with all but three receiving raises in the year before they left state service. The raises increased the employees’ leave payouts by an average of $7,500 apiece, The Times’ analysis found. “That’s in line with pension spiking,” said Jon Coupal, president of the Howard Jarvis Taxpayers Assn. — likening it to boosting retirement pay with last-minute salary increases, a practice banned in many cases under a 2012 reform law. “It’s an abuse and it should be corrected with legislation,” Coupal said. Sartipi took home an additional $15,000 for unused time off thanks to a 4% raise in his final year of work. The onetime district director for the California Department of Transportation in Alameda County received $405,119 for banked time off — the equivalent of more than 4,400 hours of vacation, or two years of stored leave, according to The Times’ analysis. His annual salary when he retired was $191,208. When asked for comment, Sartipi declined. The state controller’s office would not provide the number of vacation days for individual employees, saying the information was confidential, but did provide how many hours agencies had on the books as of 2017. But of the 20,400 workers who cashed out their time off last year, nearly 6,200 received at least $10,000. The majority of vacation payouts were less than $5,000, the analysis showed. Many who received large payouts worked in prisons or public safety positions, where staffing shortages and emergencies can make it difficult to schedule vacations. “I would have rather had been taking time off than taking a payout,” said Kim Zagaris, the former fire and rescue chief for the Governor’s Office of Emergency Services. Zagaris, whose state career spanned three decades, received $218,000 from unused vacation when he retired last year. He said the tax bite out of that lump-sum payment was around 40%. The number of vacation hours banked by state workers jumped in the years after 2009, when California furloughed workers during the recession. The forced unpaid time off meant many did not need to use vacation or could not afford to. In 2016, the Department of Human Resources began tracking the amount of unused leave accumulated and working with managers to have those over the cap create plans to use the time up. A spokesman said the department plans to post the state’s total number of unused vacation hours and the cash value of that liability online later this year. As of 2017, state workers had accrued 75 million hours of paid leave, according to the controller’s office. The Department of Rehabilitation and Corrections accounted for a third of those hours, which carried a $1-billion price tag. The California Highway Patrol had $396 million in unused leave on the books, the data show; Caltrans was on the hook for $366 million. When J.J. Jelincic was ready to retire from the California Public Employees’ Retirement System in January 2018, he opted to take his vacation time instead of a lump-sum payment. Jelincic, who has been on vacation for more than a year, said that was the smarter investment. Because while on vacation, he has received a 4% raise that went to everyone in his job classification. And since he is still an employee, he is increasing his total state service. The net impact will mean an increase of his pension. Jelincic is also accruing more vacation time while on vacation — and receiving holiday pay. The state requires employees to get a manager’s approval to burn down their vacation before retiring instead of receiving a lump-sum payment. Mike Genest, who served as budget director for former Gov. Arnold Schwarzenegger, said there are times when large payouts to hardworking state employees are warranted. “But, I would say most of the time it is abused,” Genest said. He received $37,000 in unused time off when he left the Department of Finance in 2009. 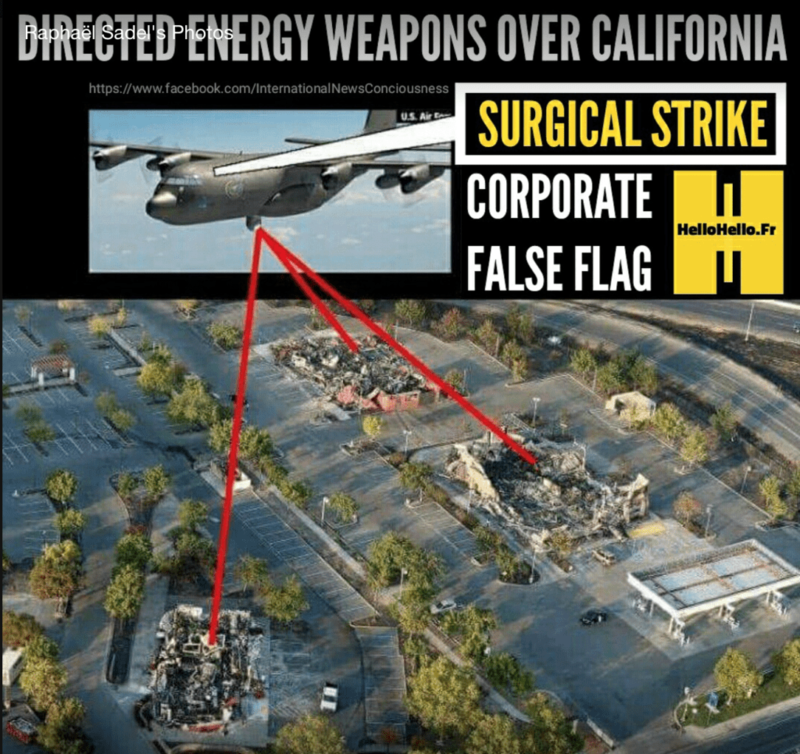 This entry was posted in California, Government and tagged California on March 10, 2019 by Bone Fish. In Spanish, Sierra Nevada means “snowy mountain range.” During the past few months, the range has certainly lived up to its name. After a dry spell in December, a succession of storms in January and February 2019 blanketed the range. In many areas, snow reports have been coming in feet not inches. Back-to-back storms in February dropped eleven feet (3 meters) of snow on Mammoth Mountain—enough to make it the snowiest ski resort in the United States. More than 37 feet (11 meters) have fallen at the resort since the beginning of winter, and meteorologists are forecasting that yet another storm will bring snow this week. 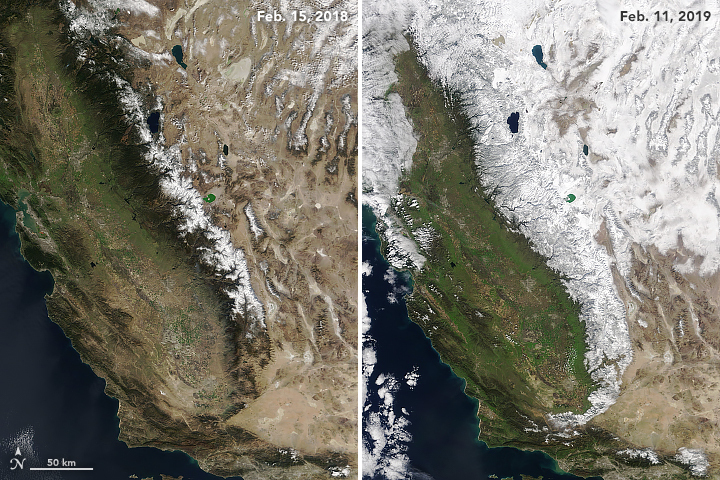 The Moderate Resolution Imaging Spectroradiometer (MODIS) acquired these natural-color images of the Sierra Nevada on February 11, 2019, and February 15, 2018. In addition to the much more extensive snow cover in 2019, notice the greener landscape on the western slopes of the range. Statistics complied by the California Department of Water Resources indicate that the mountain range had a snow water equivalent that was 146 percent of normal as of February 19, 2019. It was just 44 percent of normal on Thanksgiving 2018. Last season, on February 15, 2018, snow cover was at a mere 21 percent of normal. Some of the snow has come courtesy of atmospheric rivers, a type of storm system known for transporting narrow, low-level plumes of moisture across long ocean distances and dumping tremendous amounts of precipitation on land. The condition of Sierra Nevada snowpack has consequences that go well beyond ski season. Spring and summer melt from the Sierra Nevada plays a crucial role in recharging California’s reservoirs. Though conditions could change, California drought watchers are cautiously optimistic that the boost to the snowpack will insulate the state from drought this summer. The reservoirs are already in pretty good shape. Cal Water data show that most of the reservoirs are already more than half-full, and several have water levels that are above the historical average for the middle of February. NASA Earth Observatory images by Joshua Stevens, using MODIS data from NASA EOSDIS/LANCE and GIBS/Worldview. Story by Adam Voiland. This entry was posted in California, climate change and tagged Climate Change, drought, Global Warming on February 21, 2019 by Bone Fish. Eric Bauman, the CA Democrat party’s first openly gay chairman. California Democratic Party Chairman Eric Bauman, who is facing an internal investigation after multiple party staffers accused him of sexual assault or harassment, is taking a leave of absence until the probe is finished, the party announced Monday. Party spokesperson Mike Roth said Bauman had decided to take a leave of absence “[a]fter taking the holiday weekend to consider the most constructive path forward for the work of the California Democratic Party”. The internal investigation was launched after party Vice-Chair Daraka Larimore-Hall called for Bauman’s removal over what Larimore-Hall described as “credible, corroborated and utterly heart-breaking allegations” by “a number of party staff” who claimed Bauman harassed or assaulted them at party functions. Others including California U.S. Rep. Ro Khanna and the Orange County Young Democrats called for Bauman to step aside. Larimore-Hall’s email did not include details about either the alleged incidents or the affected staffers. The Sacramento Bee reported that Larimore-Hall spoke to two accusers and a witness before sending his email. The party’s executive board could vote to remove Bauman from office. However, Larimore-Hall’s call for Bauman’s removal is still several steps from such a vote. Bauman’s leave comes just weeks after California Democrats made major gains in the midterm elections, winning key congressional seats in territory long held by Republicans. A series of sexual misconduct allegations against lawmakers, lobbyists and others in politics rocked California’s political world late last year, at the height of the #MeToo movement. 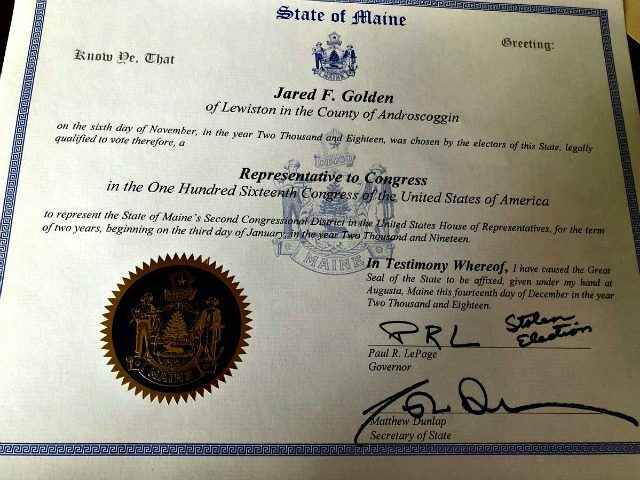 Three Democratic men resigned as state lawmakers after investigators hired by the state legislature found they likely engaged in inappropriate behavior. Again, no police reports, no arrests, no convictions… ever. Bauman narrowly won the party chairmanship last year against Kimberly Ellis after a contentious battle between establishment Democrats and progressive activists. During that fight, Bauman said he was falsely targeted by rumors he engaged in inappropriate behavior with teenage boys. Bauman is the party’s first openly gay chairman. Bauman called the rumors “despicable lies,” and Ellis denounced them. First Vice Chair Alex Rooker is set to take over Bauman’s duties while the investigation proceeds. This entry was posted in California, Politics and tagged California, gay on November 28, 2018 by Bone Fish. Diane Feinstein. (May 16, 2016). OGE Form 278 Financial Disclosure 2015. OGE. AVID Technologies, Inc., Co. No. 0000896841. (Accessed Aug. 07,2018). Form 4 Insider Trading. SEC Edgar. This entry was posted in California, Government, Politics, Tyranny and tagged Diane Feinstein, Election Fraud, Richard C. Blum on August 7, 2018 by Bone Fish.